Increase the image quality of your JPEG photos. Is there a better alternative to Topaz DeJPEG? Is Topaz DeJPEG really the best app in Image Editing category? Will Topaz DeJPEG work good on macOS 10.13.4? Note: Although Finder indicates that this is version none, the developer refers to it as version 4.0.2. Auto updater. Get software updates instantly. New user interface. Includes the ability to easily expand and collapse side panels and parameter tabs for an adjustable workspace. Topaz DeJPEG needs a rating. Be the first to rate this app and get the discussion started! 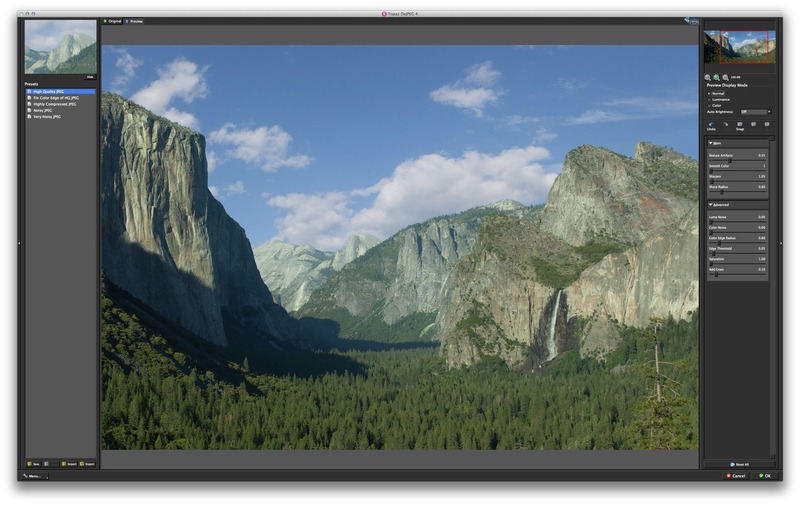 Topaz DeJPEG gives you the ability to improve the quality of your JPEG images. DeJPEG eliminates JPEG compression artifacts, which occur as a result of saving an image in the JPEG format, allowing your image detail and color to be restored. DeJPEG's underlying algorithm examines the entire image and removes all artifacts while preserving detail and enhancing an image's natural qualities. It targets all aspects of JPEG quality including sharpness, noise, and color integrity. The sophisticated tools in Topaz DeJPEG ensure that any processed JPEG image appears clear, clean, and crisp. Topaz DeJPEG is simply the best way to make the most out of your compressed JPEG photos. Ability to restore color and detail to image features. Intelligent color and line enhancement. Eliminates typical JPEG image distortions that degrade image quality. Use DeJPEG to ensure that any batch of high-quality JPEGs look just as good as if they were shot it in RAW. Designers who work with web images find DeJPEG invaluable for rescuing otherwise unusable pieces of stock photography. One of the most popular uses of DeJPEG is to counteract unwanted color "bleeding" and information loss that occurs even in high-quality JPEG images. Topaz DeJPEG's color sharpening and edge restoration tools actually reconstruct softened color edges, bringing out previously unseen image details and restoring sharpness to damaged edges. This is highly useful in many Photoshop tasks like masking and also makes the image look much cleaner in general. Point-and-shoot and camera-phone users take advantage of DeJPEG's extensive artifact reduction capabilities to enhance the quality of their snapshots. Snap / Recall buttons. Save up to 99 snapshot settings for comparison. Preset enable / disable option. Option to enable or disable the preset preview processing at program startup. Preset navigation. Use the up / down arrow keys to navigate the preset list and display the selected preset thumbnail (in preset preview window). Use the return (Enter) key to apply the currently selected preset. Enable / disable tool tips. Option to enable or disable the pop up tool tips. New presets layout. The new preset format features its own preview window. Quick slider reset allows you to double-click on the slider name to easily reset default slider values. Larger image abilities. Significant stability increase for processing large images.